TodoToday v0.4.0 has been released to the Android Market. This release adds a couple of new features. 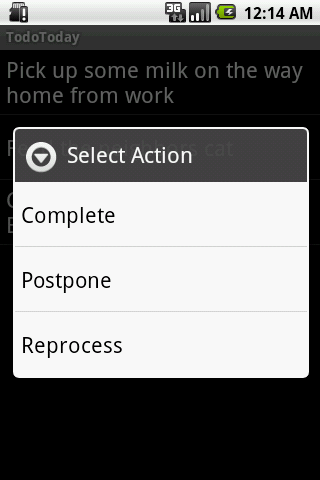 A new option to "Reprocess" a task has been added, in addition to the "Complete" and "Postpone" task actions. Using the reprocess option you defer the task from your active task list for future attention. The Reprocess action will remove the due date and move the task to the Remember The Milk Inbox task list. The new "Undo" option on the application menu will undo the most recent action to complete, postpone, or reprocess a task. Using the undo you can revert from making an incorrect action selection, or selecting the wrong task. Only the most recent action can be undone. Changes to tasks using the Remember the Milk website, or another application after the initial action may invalidate TodoTodays ability to undo. For the Undo feature TodoToday now requires full permissions to the Remember the Milk API, existing users will be prompted to re-authorize the application to grant the additional permissions.